Any photog who shoots under a variety of real life conditions needs a quiet, unobtrusive camera for those moments when it’s time not to draw attention to their shooting. Mirrorless cameras meet that need plus many others and finding a good but inexpensive model for those situations adds flexibility to any gear bag. That’s why we’re digging deeper into the best mirrorless cameras under $500, body only. 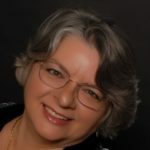 In recent years, manufacturers have upped their mirrorless camera products, adding features that make them on par with digital single-lens reflex (DSLR) models. Improvements in interchangeable lenses specifically designed for mirrorless cameras grew the market, too. Today, digital mirrorless cameras come in all sensor formats with high-end video capability and plenty of other reasons to make them your go-to body of choice. The mirrorless camera label is self-descriptive – a camera without the optical mirror we find in DSLRs. It lacks the traditional prism viewfinder, relying instead on a digital display system. The image passes through the lens and hits the sensor, which in turn sends the framing to your LCD screen. This presents opportunities for better framing, more accurate settings, and faster shooting. The thump of the shutter we’ve grown used to on DSLRs is missing, because there is no need for the mirror to drop or the mechanical shutter to release. This makes a mirrorless interchangeable lens camera (MILC) a notable solution for those shooting situations where silence is the photog’s bests friend. Here’s the other side of that story. Because the wedding of lens to body is part of that digital display process, mirrorless lenses only work on mirrorless cameras. Unless you find a mounting system that accommodates DSLR models too, you’ll be buying a set of lenses for your MILC alone. When should I use a mirrorless? Mirrorless cameras were often ranked as also-ran instead of real enthusiast contenders because of electronic problems. Historical issues around lag times between depressing the shutter button and an image displaying and other faults have been addressed successfully. Some professionals now swear by them exclusively, which says a lot in a marketplace where the myriad choices available to those willing to make substantial investments are rich and broad. MILCs now excel in shooting situations requiring an extra steady shot, like extreme telephoto or low shutter speeds. Because they are fully electronic, video imaging happens faster and with greater accuracy. They also boast some of the best autofocusing systems around and provide a live depth of field view of your subject, allowing you to adjust for low light or bright light situations with precision. Just as important is the lack of mechanicals in a mirrorless camera. This makes them simpler, faster, and less likely to suffer from wear and tear from vibration. Since there is no mirror, pentaprism and box around them, MILCs are much smaller and lighter than a comparable DSLR. What’s not to love about MILCs? You’ve probably already realized that all of those electronic capabilities come with a price, and that’s battery life. Mirrorless cameras race through charges. Buying extra batteries and keeping a set of rechargeables ready in your bag is a given. Another complaint is one we alluded to, the commitment to a set of lenses that will probably work only on your mirrorless camera. In the price range we’re talking about here, $500 or less for the body, you can expect to pay almost as much for decent glass. Many photographers entering the mirrorless world at this entry point buy a kit that usually comes with a Nifty Fifty to see how they like it, before making additional investments. Like budget DSLRs, all bodies are not created equal in the mirrorless world. You can buy an inexpensive body and a basic lens with minimal quality in either and find disappointment. At the other end of the spectrum, professional full frame sensor mirrorless bodies and high grade glass might not be that much better than good midrange equipment in the hands of a photog who hasn’t learned focus and framing basics. What should I look for in a mirrorless body? As with any interchangeable lens camera, you need to know your sensor size. Mirrorless cameras come in an array of sensor sizes, from medium format (larger than 35mm) to full frame (equal to 35mm) to Four Thirds (half the size of 35mm). I’ll say more about the crop factor calculations you’ll need to make when you select lenses under the sensor topic in our criteria below. Image stabilization (IS) becomes less important here if you’re not planning on shooting under typical shake conditions, such as super telephoto or very low light. However, depending on how you plan to use your camera, it never hurts to have IS as an additional safeguard. If your selection has a touchscreen to change settings, you’ll be spending less time moving dials and hitting buttons, too. Some mirrorless cameras have an electronic viewfinder you can put your eyeball to, if you crave that convention. The full set of autofocusing options can be displayed as dots on your screen or automatically, depending on your body selection and settings. In short, you can make it act like a DSLR if you want it to. What kinds of shooting are better with mirrorless? The pros say mirrorless cameras are terrific for street work, particularly photojournalism and situations where you don’t want to appear to be shooting. The same could apply for tender moments, kids’ parties, and nighttime special events. The lack of vibration also makes wildlife at a distance shine. Landscape work is made easier by the ability to make those fine-tuning adjustments to take advantage of special lighting. Your image quality improves under low light situations because the lighter camera body makes keeping it steady easier. With the right glass and an electronic internal viewfinder, an MILC can also be a benefit for studio portraiture. They help you blend into the scenery during wedding shoots because they lack that annoying thump. Best of all, you can shoot for hours (as long as you bring batteries) without your arms getting tired from lugging a behemoth. How are mirrorless cameras for shooting video? Video is a place where MILCs can shine. DSLRs must be in live view mode to shoot video, which means you’re watching the LCD on the back of the camera instead of using the viewfinder. That puts them at the same battery-reliant disadvantage. The difference for mirrorless is the ability to still use an electronic viewfinder, simply because it’s electronic and showing what comes through the lens. It would be like watching a movie in live time. If you’d rather frame your videos through the viewfinder, a mirrorless can give you that choice. Some mirrorless bodies come with 1920 x 1080 resolution video capability. This works well for any work you plan to display on a small screen, like a computer or social media. If you plan on using your videos on large screens, look for a 4K resolution model. How do I decide which mirrorless is best for me? It’s best to start your mirrorless body shopping by considering the kinds of photography you’d like to do. Not all manufacturers make all lens range options available for their equipment. You may also find that the body is reasonable, but the prices for lenses are above your comfort level. After you confirm the lenses you would want are available in the product line you’re interested in, take a look at our checklist of features and settings below. Only you can decide how important something like IS or 4K video is to your requirements. Don’t settle if the body doesn’t have the features you need. What’s your plan for your camera and your preferred shooting style? That’s the place to begin in any assessment of a new camera purchase. Past that, it comes down to features and how well they match with your desires. If you’re shooting family vacations or want a camera that’s easy to slip into a pocket or tote, think about ease of use and fewer fancy features. If you’re shooting runway models or race cars, you are going to want more. Our list of the best mirrorless cameras under $500 is based on what reviewers say about the following criteria. The generally accepted principle has been that the larger the sensor, the better the image quality. That is true to a point; many other factors come into play as well. Most importantly, you need to consider your sensor size to understand the effective or equivalent focal length of your lens. The focal length (#mm) of your lens is stated as if it was attached to a full frame sensor body, mimicking a 35mm film system. If you buy a body with an APS-C sensor, you’ll be multiplying your focal length by either 1.5 or 1.6 (depending on the camera brand) to calculate the equivalent (real field of view) focal length, because that sensor is smaller than 35mm. Four Thirds is even smaller and requires you to multiply by a crop factor of 2. This brings you an advantage in overall camera plus lens weight. If you buy a camera with a Four Thirds sensor, you can buy a shorter focal length lens like a 200mm (lighter than a 400mm telephoto) and when you apply the crop factor of 2, it will take photos like a 400mm. The same applies for an APS-C with the same 200mm lens, which would then pull in the distance like a 300mm. Megapixels are the image capture spots on your sensor. This one’s easy. The more megapixels, the better. However, once you get above 24 MPs, the benefits diminish. The more MPs, the larger the digital file size in bytes. This means that transfers to an external drive or via the internet will take longer and are more prone to fail part way through. The sweet spot in our mirrorless body price range is 16 to 24 MP. Even at the low end, this is more than adequate to produce bright, sharp photos for the average prosumer or enthusiast’s needs. ISO refers to sensitivity, how well the sensor captures light. The lower the bottom number in the range, the better this camera handles bright light conditions. A wider range at the high end produces the best shots in extreme low light conditions. If you have been shooting point-and-shoot cameras, not having this viewfinder feature might not make any difference to your choice. If you prefer to use a viewfinder, some mirrorless cameras give you that option. You’ll recall that if you shoot videos and want to frame it more precisely through the viewfinder, a body with an electronic viewfinder gives you a better option. Larger brands like Canon have their proprietary bayonet-style lens mounting system, in this case, EF-M. Other brands like Panasonic and Olympus have both proprietary and third party, specifically Micro Four Thirds. Under each brand, the options for different focal ranges and apertures vary. No matter what kind of body you buy, verifying the lens mount is vital. It can be different within a brand depending on how long the model has been in production, how large the sensor is, and other standard product line variations. We’ve listed the options for these specific models here. Not all mirrorless cameras come with a built in flash. Some also don’t have a hot shoe to attach an external flash. In some cases, add-on software will allow you to coordinate standalone lighting with your image capture. The battery life for a mirrorless camera will always compare unfavorably with DSLRs for no reason other than MILC reliance on all things electronic. Efficiencies in design and technology make some mirrorless choices better than others, with the average being 354 shots. Consider having extra batteries handy no matter what, since other factors such as the amount of time the camera sits on but idle also uses its juice. The greater the video resolution, the less grainy your images will appear as your screen size grows larger. If you plan to record videos on a regular basis and want to upload them for small format screen use, a resolution of 1980 x 1080 will be more than adequate. This equates to playing the resulting videos on a computer or tablet. If your uses for the video require more precision, you’ll want 4K high def video recording. An example would be filming a football game for the team, playing it on a big screen TV, and wanting to focus in on a player’s hands during a catch. Without 4K, the position of the hands might be blurry. Autofocus (AF) occurs using both the body and the lens and vary depending on the manufacturer. It’s nice to have more AF points, to expand your focusing options. Of better use are good phase detection and contrast detection features. Phase detection is what you rely on when you’re autofocusing on objects in motion. Contrast detection helps with close up accuracy in things like portraits or still life. A third version, face detection, finds the humans in the image and focuses on them. A body with IS reduces the opportunity for shake and resulting image blurring. Many lenses also come with their own IS, but that’s not a reason to want it in the body, too. Particularly if you shoot lots of low light or telephoto, IS will be important to you. The lighter the body, the easier it will be to carry and handle once the lens is attached. A pound is the approximate weight of a pint of liquid (two cups). This gives you an idea how portable these cameras will be. Here’s our list of the top ten mirrorless bodies you can grab today for under $500 (in alphabetical order). 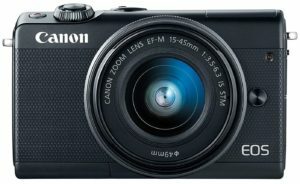 This semi-pro mirrorless is an affordable choice in Canon’s mirrorless line-up and ranks well against DSLRs, as well. The 3-inch LCD touchscreen offers a higher resolution than average, giving you a better idea of how you can frame and adjust the most precise images possible. That screen also tilts, making it great for selfies. Sixteen native Canon lenses (EF-M mount) are available for this camera, four of which include image stabilization. You can also use a Canon adaptor and mount the full range of EF and EF-S lenses (about 300) with full autofocus functioning, the most choices you’ll find in the mirrorless world. All three modes – phase, contrast and face detection – are available in this autofocusing system, with 49 AF points to choose from. It also has a video stabilizing focusing mode, avoiding post-production corrections. Image transfer covers the full range of Wi-fi, Bluetooth and NFC (near-field communication). If you’re used to a viewfinder, you’ll have to adjust to LCD only on this camera. This can be a problem in bright light situations. The camera does not offer image stabilization, which can be a concern in low light or telephoto shooting conditions. The battery life is considered lower than usual at 295 shots, so buy extras with your body. Even with this limitation, it is considered an excellent choice for street work because of the face detection AF and live view video screening. It is also rated as good by reviewers for all other types of photography, and coupled with the broad range of lens choices, it’s a terrific mirrorless selection at an affordable price. Another in the M series from Canon, this body is super-light and portable (makes for a good travel camera) while producing great images for the money. Its articulating touchscreen is great for taking selfies and making on the go adjustments to your image settings. Reviewers love its low light capabilities due to its ISO range. Like the M6 previously listed, this camera can use all of Canon’s EF and EF-S series lenses with an adaptor, plus the native EF-M lenses. Its 24 MP sensor resolution is among the highest found in mirrorless cameras. File transfers can happen using full Wi-fi connectivity, including Bluetooth and NFC, so moving your images to other storage devices is easy. The full range of extensive autofocusing offers you the ability to track and freeze your settings with ease. It also has a digital video stabilization mode to assist in eliminating shakes in recordings. Reviewers like it for all around shooting flexibility and versatility. This camera has a very low battery life, meaning carrying extras are a must. The M100 flash capability is limited to its built in range, as it has no flash shoe. Since it has no internal viewfinder and no ability to attach an external one, you will rely on the LCD screen for framing and settings. Because of these issues, portrait and landscape photography are not recommended uses for this camera. If your main goals are shooting everyday life, family outings and sports stills and videos, though, this is an affordably priced solution for your mirrorless needs. Just add a lens from your myriad Canon choices and you’re ready to image the world. 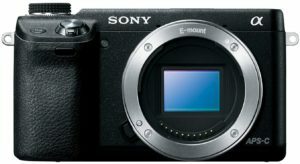 This entry level mirrorless is attractive to reviewers because of its overall features and value for the money. Its articulating LCD screen makes it easy for taking selfies, along with a remote control app you can install on your smartphone. It also offers time lapse recording. The autofocusing system includes contrast and face detection with 49 AF points. The proprietary lens mounting system includes 43 native lenses, nine of which have optical image stabilization. 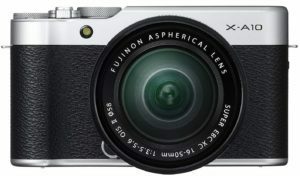 Users appreciate that this Fujifilm is lighter in weight than many other mirrorless models at this lower price point. Video resolution is solid for small screen results. 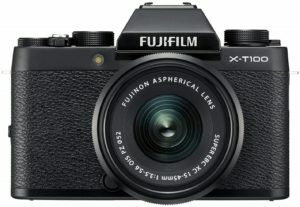 If you’d like to shoot 4K or want a higher resolution sensor, save up a bit more and look for the Fujifilm X-T20. Either choice will be a great one for most of your shooting needs. This camera does not have an anti-aliasing (low pass) filter, which means moiré (patterns not actual in the subject) may occur in some shots. Flash capability is limited to the reach of the built in alone. The LCD is not a touchscreen, which means that you’ll be making settings changes using dials and buttons. Phase detection AF is not a feature, which causes some reviewers to only recommend this camera for limited use. Based on its lower sensor resolution and phase issue, it is only considered average for portrait or landscape work where details are important. However, for family vacations or daily shots, this entry level camera gives you an opportunity to try a mirrorless that fits in your pocket. 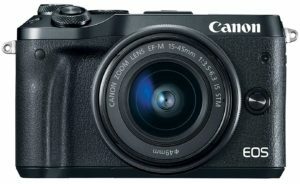 This camera ranks well all around with reviewers, including its portability and image quality. Even better, it has features to spare, such as the built in electronic viewfinder and 4K video. Adjustments to settings and selection of focus points are made easy on the touchscreen, which also articulates. Autofocusing is available in all types over 91 focus points. The electronic viewfinder covers 100% of your image, meaning what you see there is what your camera will record. This model uses Fujifilm’s 43 native X mount lenses, nine of which include optical image stabilization. That 4K video capability is one of the things that sets this camera apart in its mirrorless group. Couple this with the AF system, and you have a great camera for shooting action. File transfers can occur immediately through both Wi-fi and Bluetooth technology. This body has a slightly heavier weight and a slightly larger size, but neither of those facts seem to raise issues for users. The only other issue reviewers note is the lack of IS, but that is not unusual for cameras in this group. The ISO range is a limited for low light situations, but not enough to cause concerns. This is a solid all around choice for every other type of photo situation, with the big plus of 4K video. It will easily take you from daily life to the sports highlights with a family birthday thrown in between. Better yet, you’ll be ready to share your images at the touch of your LCD. 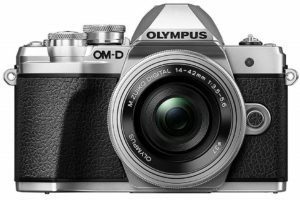 Yes, this is an older version, with the latest offering being the Olympus E-M10 Mark III, and if you are willing to spend $100 over our $500 budget, it might be worth it to you. The older model offers a few features that make it a preferred choice, like a slightly lighter weight. The newest model has a better viewfinder, which might make enough of a difference to have you saving up a bit more for your purchase. The Micro Four Thirds (MFT) lens mounting system is the most diverse of any mirrorless. In addition to nearly a hundred Olympus lenses, you can also buy Panasonic and third party models. All are considered high-quality glass at an affordable price. Another feature setting this camera apart from other manufacturers is sensor based IS, making it less important to have IS in your lens. Because of this and its range of AF settings plus higher number of focus points, it’s deemed to be excellent for photojournalism-styled work. Why spend the money for the newest Mark III model? The III has slightly faster continuous shooting, and slightly better image stabilization. Focus points increase from 91 to 121, and the resolution of the viewfinder also has been improved. Perhaps the biggest reason would be for video, because the Mark III model shoots at 4K resolution. Both models are good for portrait work and daily life photos, though not the best for landscapes where details are important because of the lower sensor resolution. Based on user feedback, either will be a great addition to your gear bag. Users love this selfie-friendly camera for its articulating touchscreen LCD, straightforward settings, and ease of shooting. The many lenses available, as listed for the E-M10, offer something for everyone and beyond. This camera meets almost every shooting need. Reviewers note the portability of this camera and its great features as positives. The dual-axis electronic level makes keeping horizons straight and buildings from appearing to lean. If relying on the LCD for framing isn’t your thing, you can add an optional external viewfinder. This camera body is one of smallest overall in our listing, based on height and thickness. This is due in part to what it doesn’t have, like a built in flash and internal viewfinder. However, for many casual shooting uses, it’s a great entry level selection. 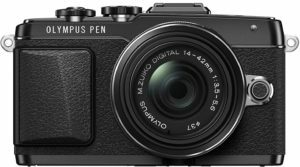 If you’re in need of higher res videoing, consider increasing your budget by $100 and buy the newer Olympus PL9 camera. Be aware, though, that while this PL7 is a solid choice for low light situations because of its high ISO range, the PL9 is not. Most other features are comparable, so only you can decide if that 4K video upgrade is worth enough to give up low light versatility. Because of its IS, the PL7 is considered a good choice by reviewers for portrait work as well as sports and family events. It lacks detailing for landscape because of its lower sensor resolution. Its ease of use for photojournalism and breadth of lens choices make this a stand out for general mirrorless shooting. 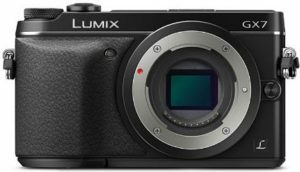 It’s not the norm to find a reliable semi-pro mirrorless with lots of lens options, but this Panasonic fits that billing. Almost 100 high-quality glass options in the Panasonic line along with Olympus and third party MFTs make this a versatile body for all your photog needs. A fully articulating touchscreen LCD is a benefit for selfies as well as on demand settings adjustments. One feature making this a stand out is the video capability. At 4K, this means your moving images will remain clear and crisp, even on large screens during replay. This is coupled with a 4K photo mode, allowing you to capture 8 MP photos from frames within your videos, something few other mirrorless cameras at this price point would have. While the number of focus points is not the highest seen in our listing, the post focus mode might make up for that. Using the 4K video and focus bracketing, you can stack a series of images and move the focal points to create a still. This flexibility is something not offered in many other bodies. While the lower sensor resolution and lack of IS do not make this camera the best choice for landscape work, it is a generalist with good ratings for all other kinds of conditions. Its buttons and dials are intuitive, or you can rely on the touchscreen to change settings. It isn’t the faster in continuous shooting situations, but its 1/16000s shutter speed is among the highest available and almost makes up for this. Yes, there is a newer version Panasonic available, the Panasonic Lumix DC-G9, with many of the same capabilities. It’s also almost three times as costly and twice as heavy. If you want a good multi-purpose camera with enough lenses to satisfy your every whim, the G7 is for you. This semi-pro camera comes from a long line, and with each generation, Panasonic continues to make improvements to bring more to the user. A higher resolution internal viewfinder that raises from the body and tilts to meet your viewing needs is one of the innovations in this model. Panoramic shooting is a plus for landscape work, even at its sensor resolution. If you want a camera that does well in bright light as well as low light, the GX7 might be a good choice for you. Reviewers appreciate the tilting touchscreen LCD and easy to understand settings controls of this model. Also a benefit is the long list of lenses available, as we noted with the previous Panasonic on our listing. Users remark that the overall value for the money spent is well worth it, given the many unique features of the GX7. Its compact size fits well in your pocket, and with IS and good ISO range, it’s a fine selection for photojournalism and street scenes. The fast shutter speed covers sports with ease. 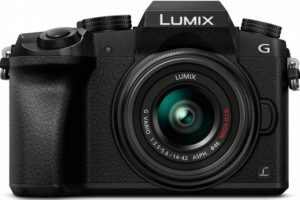 If you want 4K video resolution, slightly better sensor resolution and faster continuous shooting, you’ll need to upgrade your purchase to the Panasonic Lumix DMC-GX8 – along with doubling your budget. At 23 focus points, the limitations of the AF system in the GX7 can disappoint some. In most other features, it is equivalent with the heavier, more expensive (in the $1000 mirrorless camera range) GX8 model. Sometimes newest isn’t best, particularly when you consider the budget you have to spend. Offering full WiFi connectivity, this camera will allow you to shoot with speed and accuracy and transfer your image files with ease. Spend your savings on another lens instead and get the maximum enjoyment out of this camera body. This is a reviewer favorite across the globe. Image quality from the higher sensor resolution is the number one reason people rave about this camera, particularly those who are moving from shooting with their smartphones. The whopping 179 focus points in the AF coupled with all major focusing modes make this little mirrorless stand out in the crowd. Other features user like are the large (3-inch) tilting LCD touchscreen, allowing you to adjust settings without a lot of button and dial work. You can also do post-production editing from the screen, helping you to see how a special effect will work out immediately, while you can still re-shoot the image. With built-in Wi-fi transfer capability and NFC connectivity, you can move your images to a storage device or share them right away. Lens versatility is another benefit in this system. Sony makes over 80 NEX E-mount lenses, with more being added all the time. Third party lenses also work as well as Sony A lens systems (with adaptor); two manufacturers also make adaptors said to allow Canon EF lenses to be used with full AF functionality. The lack of an internal viewfinder and no ability to add an external one can be a drawback for some, though if you’re used to point and shoot or smartphones, that should not be an issue. You are limited to the built in flash’s range. Continuous shooting speed and maximum shutter speed are lower than other systems in our listing. While this camera isn’t considered ideal for detailed close-up work because of its lack of a viewfinder for fine framing, it rates well for all other styles of photography. One mode to mention is landscape work, where the higher sensor resolution makes this camera stand apart. Versatility, size and image results are three reasons to make this a required choice in your gear bag. This semi pro body has withstood the test of time, and while it does not offer all of the bells and whistles of the previous Sony on our list, it serves as a reliable basic camera to consider as an entry to mirrorless work. It ranks highly for image quality and portability, given the features at this price. Its ISO range makes it a good contender for low light shooting. The 99 focus points and AF modes brings more flexibility to your range of styles. Fast continuous shooting and panorama shooting are two features that set it apart from other comparable cameras on our listing. The built in electronic viewfinder is another feature users love. As for our previous Sony listing, the Sony NEX mount offers an array of native, Canon and third party lenses to be used. The tilting screen helps in shooting great selfies. A full range of WiFi-enabled connectivity aids in transferring files to storage devices without a physical tether. This camera does not offer a touchscreen LCD, so you will rely on the buttons and dials to change settings. While video resolution is acceptable for small screen use, it is not the 4K level you will want for large screen viewing. The sensor resolution does not make this the best candidate for landscape use. 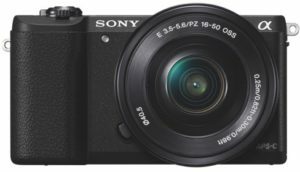 Reviewers rate this Sony as a good all around candidate for most types of other photography modes. It works for portraits because of the resolution its internal viewfinder, as well as daily life because of its size and weight. If you’re looking for a higher quality first mirrorless with loads of versatility, it could be your camera of choice.